Staples is offering 20% off everything you can fit into their bag (which is free), which means there will be some great deals to be had! Valid in Staples® U.S. stores only. Discount on Staples® EcoEasy(sm) bag, item no. 708691 and 581100, will be taken at register at time of purchase. Limit one coupon per customer per day. While supplies last. Cannot be combined with any other coupons. Not valid on kiosk orders. Discount applies to products that fit within the customer’s Staples EcoEasy bag only. All chairs, furniture and clearance items (including clearance desktops, laptops and tablets) are included in this promotion. Not valid on desktop or laptop computers, tablets, Chromebooks, Apple® products, Bose® products, Amazon Kindle®, HP ink and toner, Epson® ink and toner, Keurig® coffee brewers, Beats®, Steelcase®, Texas Instruments® TI graphing calculators, printers, fax and copier machines, business machines, all case paper, cases of water, all Copy & Print Center orders, USPS, UPS, Staples® EasyTech(sm), SquareTrade® warranties, gift cards, mobile phones and mobile phone services, phone cards or postage stamps. Each item purchased can only be discounted by one coupon, applied by cashier in order received and prior to tax. Coupon not valid if purchased or sold and must be surrendered. No copies/facsimiles. No cash/credit back. Not valid on prior purchases or purchases made with Staples® Procurement or Convenience Cards. Cashier Instructions: 1) Scan customer’s Staples EcoEasy bag and contents inside. 2) Scan any product-specific coupons applicable to the transaction. 3) Scan or enter the coupon code to discount the Staples EcoEasy bag. 4) Scan or enter the 20% off coupon. Already have a Staples® EcoEasy(sm) bag? Bring it in store, fill it with everything you need and receive your discount. Discount only applies to customers with a Staples EcoEasy bag, item no. 708691 and 581100. 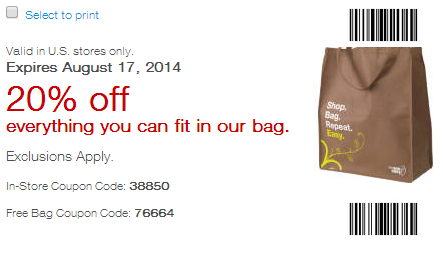 Discount on Staples® EcoEasy(sm) bag, item no. 708691 and 581100, will be taken at register at time of purchase. The bag is free, so even if you don’t find anything to purchase, at least go for the free bag! Almost all the coupons say this, so using other coupons with this offer is very YMMV. I suggest trying at least. Remember that $ off coupons usually can stack with % off coupons, even when they say they can’t. Not valid on Kiosk orders. This won’t work online sorry. Discount applies to products that fit within the customer’s Staples EcoEasy bag only. The items have to fit in your bag, however, I don’t think this will be enforced. All chairs, furniture and clearance items (including clearance desktops, laptops and tablets) are included in this promotion. How are you supposed to fit a chair or furniture in your bag? This is the best part about this coupon, clearance items are included! You can find all of the current Staples coupons here.